The 1956 floods occurred due to higher than average rainfalls in Western Queensland along with heavy rains three months prior in the Murray catchment areas such as the Murrumbidgee and Lachlan Rivers. The floods peaked at 12.3 metres in Morgan. Some areas were flooded up to 100 km from the natural flow of the river. 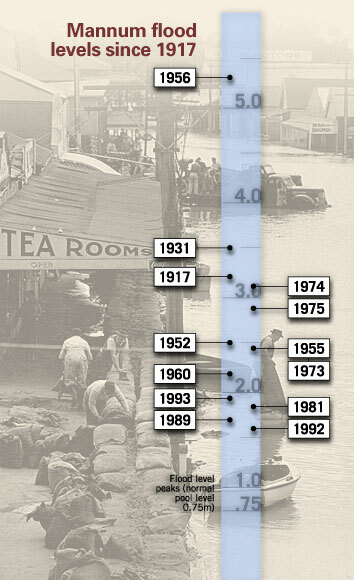 The 1956 flood moved down the Murray and Darling Rivers for seven months and peaked between 11 and 14 August. It was the highest level flood recorded at Merbein since the irrigation district was established in 1909. The River Road from Mildura to Merbein was initially protected from the flood water by levee banks in three places during the 1956 floods. All three banks are still readily distinguishable. Two of the levee banks broke and the River Road between Mildura and Merbein was then flooded. The ‘mad mile’ levee at the bottom of Pump Hill broke on Monday July 30th. Motorists journeying to Merbein at the time recall having to turn around and return to Mildura and come back to Merbein via Seventeenth Street. Merbein residents then had to go to Mildura via Seventeenth Street until the floods receded and the road was repaired many months later. The Shilliday’s corner (3MA) levee broke on August 7. This flooded large areas of horticulture and houses in the area. A number of properties were on an island with the only access provided by the railway embankment. From this time it was deemed the embankments were not stable enough. The trains to Yelta and Merbein were cancelled for some months. On Friday August 17, the Mildura Shire announced they had carried out earthworks on the narrow railway embankment allowing the only access to the outside world for the island’s farmers. This was strictly a private road for the residents of the island to get their produce to market. At this time the Old Wentworth Road, past the Merbein Race Course, was also flooded along with the road to the Merbein Cemetery, at the bottom of Second Street. During the flood Sunraysia was very vulnerable as the district’s electricity generators were on the river banks at Red Cliffs and Mildura and there were no other sources of electricity coming into Sunraysia at that time. The Merbein irrigation pumps were reliant on the Red Cliffs generator and were therefore at risk both from local flooding and a lack of electricity, if the Red Cliffs Power Station was flooded. Merbein was very fortunate in that, for the greater part, it was situated well above the flood plain. The pumping station was, however, below river level and protected by a levee. The local growers, many of whom were returned service men from World War 1 & 2, rallied the Merbein community and rostered ‘blockies’ (farmers) to use tractors and trailers and fill sand bags to build and reinforce the station’s levee banks. The electric motors were removed to safety at the Mildara Winery. With the flood nearing its peak, the wash from the passing paddle boat PS Wanera is believed to have caused a break in the levee bank on the river road; suddenly dropping the river height at the pumping station and affording temporary relief. The growers and townspeople were successful in protecting the Merbein Irrigation Pumping Station at the foot of Pump Hill which was owned and operated by the State Rivers and Water Supply Commission of Victoria. The pumping station at the foot of Pump Hill supplied water to 10,000 acres of vines and citrus for over 400 irrigators in the Merbein Irrigation District. Wentworth, NSW, lies at the heart of the Murray Darling Basin, at the confluence of Australia’s two greatest rivers, where the Darling joins the Murray. The town is vulnerable during flood times, but Wentworth has endured many since the ‘biggest on record’ in 1870. For those living in Wentworth today, the 1956 flood lives on in their memory. A clay levee bank surrounding the town and a tractor monument are reminders of the flood that threatened the town. The 1956 ‘event’ was unique as a sustained deluge occurred down the east coast of Australia, along the Great Dividing Range and beyond. Floodwaters raced towards Wentworth from two rivers – the Darling and its tributaries from the north, the Murray and its ‘feeders’ from the south. Local knowledge played a big part in determining what could be done. Day and night for several months the townspeople, Ferguson tractors and the Army and Navy worked to avert disaster by building levees around the town. Those levees held back 80 miles of water for months. The NSW government had provided Harry Ferguson TEA20 tractors to WWII returned soldiers when they gave them their federal land allotments and irrigation systems. The Ferguson tractors were light, manoeuvrable machines, with Harry’s unique 3-point linkage for the interchange of implements, and were indispensable in the huge task in front of everyone. Fergie Tractor Rallies are held every 5 years to commemorate a mammoth effort by a community committed to fight enormous odds and determined to win. The Fergie Tractor monument, Australia’s first monument to the Fergie tractor, stands at the corner of Adams and Adelaide streets in Wentworth. The first signs of warning came in May, when reports were received of unusual high levels in the Darling. This coupled with heavy rains in other parts of the catchment area, saw the Murray rise steadily. By the end of May, low lying areas were already inundated, and people and livestock were being evacuated. In early June, Renmark’s 21st Street was closed off, and by the end of the month, the Sturt Highway between Renmark and Paringa was also out of action. The situation was eased by the introduction of a rail shuttle service between the two towns. An emergency flood committee was formed, and the whole community became involved in the fight to save the town. ‘Crash Gangs’ were formed - standing by with trucks laden with sandbags and emergency equipment. By mid August, 1,500 people had been evacuated, leaving some 800 men, women and children to battle the rising floodwaters. Shops and businesses operated with minimum staff and for reduced hours, so that as many people as possible were available to fill and transport the sandbags. Volunteers came with heavy machinery from other areas to help. A canteen was set up in the Institute, providing up to 700 meals a day, for weeks on end. The highest level of the official gauge at the Renmark Wharf read 27 feet (approx. 9 metres). An extra length of 3 feet (approx. 1 metre) was added, with the words - ‘After this, all out. The gauge itself disappeared underwater; with the official peak of the 1956 flood being determined as 30’ 7 ¾ (approx. 10.2 metres). The peak came towards the end of August with the High School, Hospital, and homes and properties in Hale Street flooded. The Ral Ral Bridge collapsed, serious breaks in the levee banks at Angove’s and the No.3 irrigation pump and the Crescent area flooded. The people of Renmark never considered that the fight to save the town could not be won and it was their faith and determination, which helped them to fight for victory. Despite the town itself being saved, the damage to houses, horticultural properties and town facilities was wide spread and the effects of the flood lasted for many years. Government grants for rehabilitation work in Renmark amounted to more than $770,000 and assistance was also given to families from voluntary donations to the Lord Mayor’s Relief Fund. 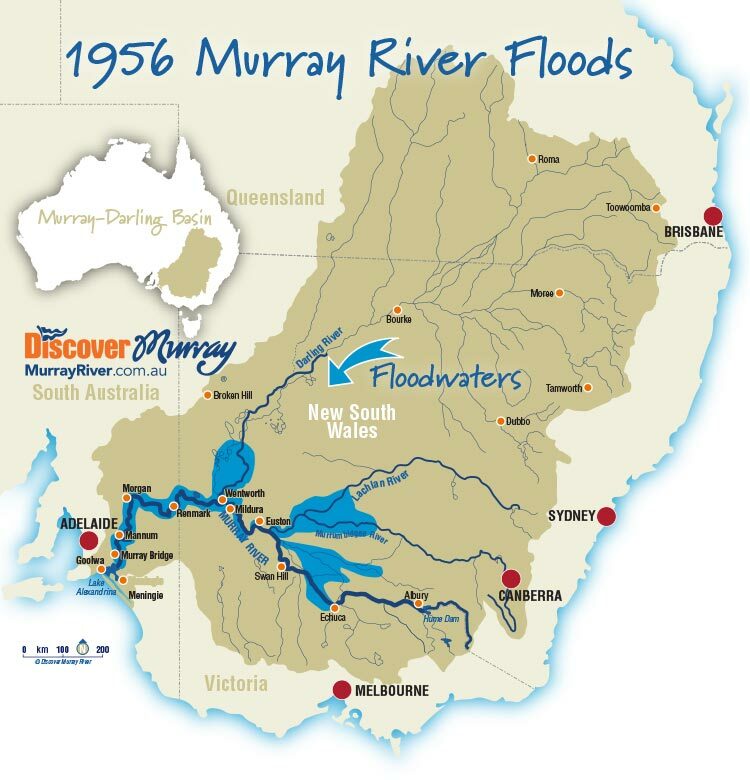 The 1956 Murray River flood is considered to be the greatest catastrophe in South Australia’s history and is the largest flood ever recorded in the state. 1917, 1931 and the floods of the nineteenth century had been large, but nothing like this. The flood occurred due to excessive, heavy rains in Queensland, New South Wales and Victoria which supplied the interstate farmers with more than enough to irrigate their crops. The Murray and the Darling were both in flood at the same time and the swelling excess water made its way to South Australia. Main river towns suffered enormously with much of the commercial and residential areas submerged for several months. The flood waters hit Mannum in July 1956.